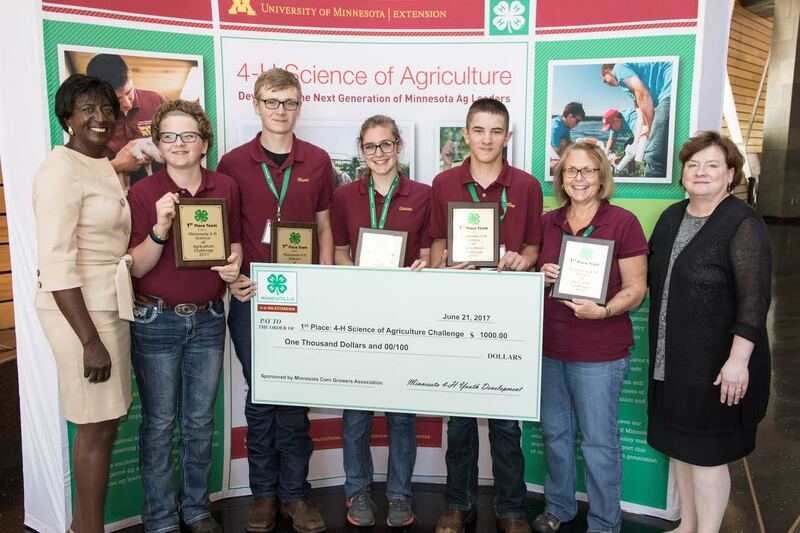 ST. PAUL, Minn. (6/22/2017)—A project to streamline temporary electric fence installation earned a team of Itasca County youth first place in the Minnesota 4-H Science of Agriculture competition. Team Itasca’s presentation on their invention, “The ATV Fencing Buddy Story,” earned top marks Wednesday from the panel of Minnesota agricultural leaders in the third annual event. Each of the team members – Wyatt Lignell, Quiana Radaich, Katelyn Slettom and LeRoy Porter – received a $1,000 scholarship awarded by Dorothy Freeman, associate dean of University of Minnesota Extension Center for Youth Development and statewide 4-H leader. and Jane Johnson, Extension chief development officer. Placing temporary electric fencing for paddocks for livestock and horses is a time-consuming and laborious task, typically carried out on foot by two or more people. The youth, working with mentors in engineering and manufacturing, invented a two-part device attached to an all-terrain vehicle that allows one person to ground posts and prepare wire to be laid while the ATV moves forward. The Minnesota 4-H Science of Agriculture project, now in its third year, is the nation’s first program in which youth partner with local expert mentors to develop science-based responses to agriculture-related issues. It was developed by Minnesota 4-H as a response to the shortage of “ag-literate” scientists and professionals to fill thousands of jobs available yearly. Second-place honors to Douglas County 4-H’ers Katie Kent, Kerryn Lund, Christina Kuismi, Kodi Bunermann and Kayla Egenes for “Talking Turkey.” Their project focused on studying use of ground corn leaves and stalks, known as stover, as turkey bedding. Their stover research included testing in turkey pens as well as data gathering from turkey growers. They each received a $750 scholarship. A team of Sherburne County 4-H’ers earned third place for citizen science work to promote testing bees for the presence of larvae laid in them by zombie flies. Their work with San Francisco State University is being carried out to help determine whether zombie flies contribute to colony collapses. The ZomBee Hunter Team of Aspen Layer, Jackson Layer and Evelyn Fuchs received $500 scholarships apiece. Science of Agriculture teams have worked with volunteer adults, as well as mentors from industries, business and education, since last fall. The program sponsors are Minnesota Corn Growers Association, Pentair, AgStar, Rahr Corporation, Jennie-O Turkey Store, Minnesota Turkey, the Minnesota 4-H Foundation and the U’s College of Food, Agricultural and Natural Resource Sciences.